This is a straight-up list of resources for the eclipse on Oct 8, 2014. Between the department move, classes starting, and Kensington Astronomy at the Beach, I’ve been a bit too busy for the urban observing posts. I’ve started October though, so hopefully I’ll have that up soon. In the meantime, here’s a bit about the lunar eclipse on Oct 8. The wonderful thing about lunar eclipses is that you can see it from anyplace where it’s night and clear during the eclipse. The interesting part of the eclipse will be 9:15 – 12:34 UT on October 8. Deepest eclipse occurs at 6:55 AM on October 8, when the Moon is about 8º above due west. Usually, you don’t need anything be clear skies and darkness to see an eclipse. Dawn eclipses are a bit tricky though since the Moon disappears into the dawn light. A telescope that can track the Moon can be very helpful to keep the Moon in sight. If you don’t have that, a pair of binoculars can also help. 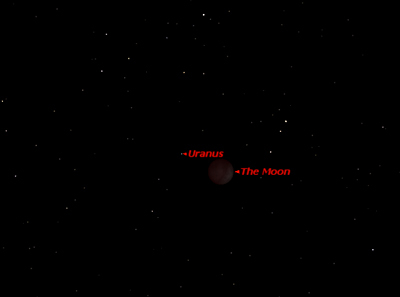 Uranus is about 1º off the eastern limb of the Moon at 6 AM. By 7 AM, it is only half a degree away but to the SE. In general, the Moon and the Sun have about the same angular size (ie they both cover the same amount of sky.) However, the Moon is very close, and its orbit is elliptical orbit, so its size changes slightly, glowing a tiny bit larger when it is close, and a tiny bit smaller when farther away. Most of the time, that change in size isn’t really noticeable. No so with eclipses. The image was lightly colorized to emphasize the location of the shadow, but it gives a perspective of the size of the Moon’s shadow on the Earth. An annular eclipse occurs when the Moon is at it’s farthest from Earth, so it looks smaller, and its shadow on the Earth is smaller. It can’t completely block out the entire disk of the Sun. People standing in the shadow see an “annulus” or ring around the Sun. This is the type of eclipse that will happen on April 29, 2014. 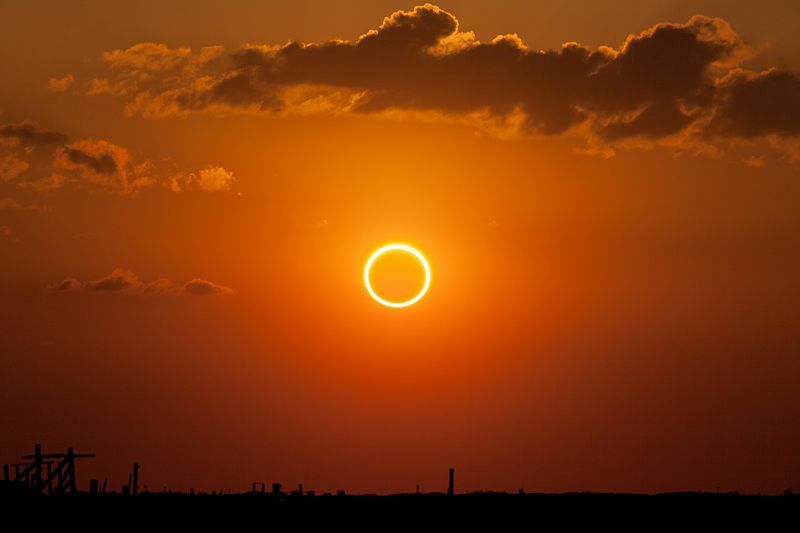 “ring of fire” solar eclipse by Kevin Baird. If you’re in SE Michigan the chances of seeing the lunar eclipse are slim. Even if it does clear up, temperatures in the upper 20s aren’t very conducive to sitting outside for several hours watching it. But don’t despair, it is the 21st century after all, and while we may not have flying cars, we do have live streaming on the internet! First up, a quick overview of the eclipse for observers in the eastern time zone: The eclipse begins just before 2 AM. By 2:30 it should be fairly interesting. The total eclipse begins at 3:07 AM and ends at 4:25 AM. The moon completely exits the umbra, ending the partial eclipse, at 5:33 AM. Those are the ones I know about. A Google search might turn up more, especially if there’re any hangouts.